You are currently browsing the tag archive for the ‘Olexander Wlasenko’ tag. We all had contact with this artist’s design. If you look closely at the “loonie” dollar coin, you’ll notice the initials RRC. Robert-Ralph Carmichael was a prolific artist who lived outside of Sault Ste. Marie in northern Ontario. The Echo Bay, Ontario artist who designed the loonie coin died this past Saturday at the age of 79. See: CBCNews story here. In November 2004, I had the great opportunity to be included in a three-person exhibition with him and along with London, Ontario-based artist Rosemary Sloot. The show titled “Corruption of Reality” was held at The Robert McLaughlin Gallery in Oshawa and showcased a trio of artists at varying stages of their commitment to realist and figurative studio production. right to left: Robert-Ralph Carmicheal, Rosemary Sloot, David Aurandt (exhibition curator), Olex Wlasenko at the opening of “Corruption of Reality” exhibition opening at The Robert McLaughlin Gallery, November 2004. 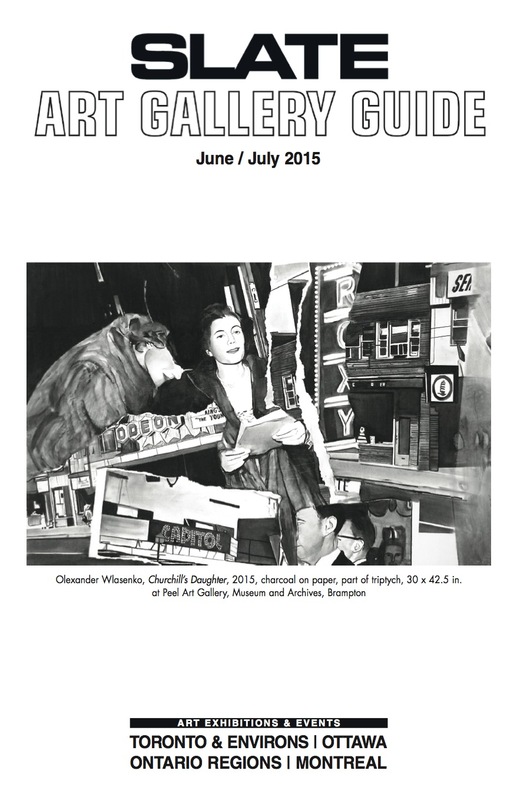 I’m honoured to have a recent drawing featured on the June/July 2015 cover of Slate Art Guide! This latest drawing is a departure from my usual practice in both form and content. If you’re in the area, please join me for the opening reception at PAMA on Sunday, June 14 between 2 and 4pm. On Sundays, June 21 and June 28, I’ll be presenting a Synchronicities: Art & Cinema marathon of art talks starting at 2pm at PAMA in Brampton. This year will mark the 21st anniversary of Station Gallery’s signature fundraiser–Drawing for Art. I’d like to donate one of my latest drawings. Both are inspired by a 1960 Italian film titled “I dolci inganni” (1960). Which drawing should I donate? The stage is set in Aurora, Ontario. 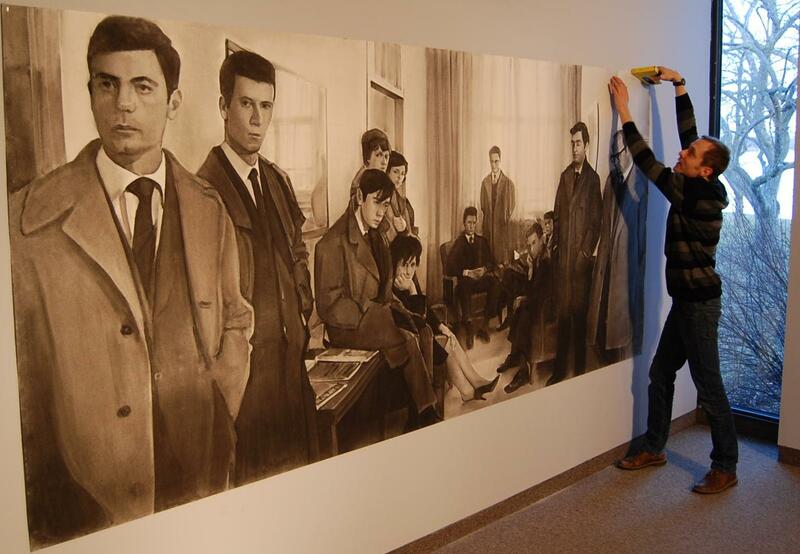 Earlier this week, we installed an exhibition of my drawings at the Aurora Cultural Centre. If you have a chance, please join me this Saturday, October 26 between 1:00 and 4:00 PM for the opening reception of “Somewhere in Time” along with parallel exhibitions featuring works by Sheila Davis, Jean Kallmeyer, Tracey Lee Green and Ellen Cameron. I’m very excited to also present an illustrated talk on Synchronicities: Art & Cinema, starting at 1:30 PM this Saturday. I can hardly contain my excitement as I write this post and will be delighted to share some recent findings of Canadian art references in Hollywood films. 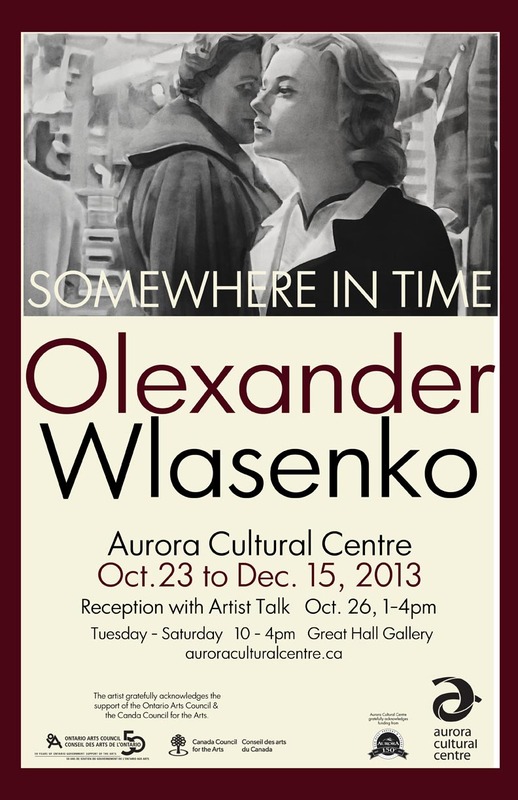 Hope to see you in Aurora! With the new year begins a new exhibition season. Yesterday was an installation day at the Art Gallery of Peterborough (AGP). A solo show of my latest drawings will open this Saturday, January 19th. Pictured below are a few shots of me putting up some charcoal drawing inspired by 60’s European cinema. When: Saturday, January 19th, 1:00 p.m. Tomorrow evening a solo exhibition of my drawings opens at the Abbozzo Gallery in Oakville, Ontario. This show captures what’s been an exhilarating and provocative year, particularly the nights when I worked in the studio to produce a new body of work. This latest series commemorates the fiftieth anniversary of a landmark year in cinema. The show titled, Cinemarks captures the spirit of 1962 in European cinema. Some of the sources for my recent works include Vivre sa vie (France), Les Dimanches de Ville d’Avray (France), L’eclisse (Italy), La commare secca (Italy) and Nine Days in One Year (Soviet Union). 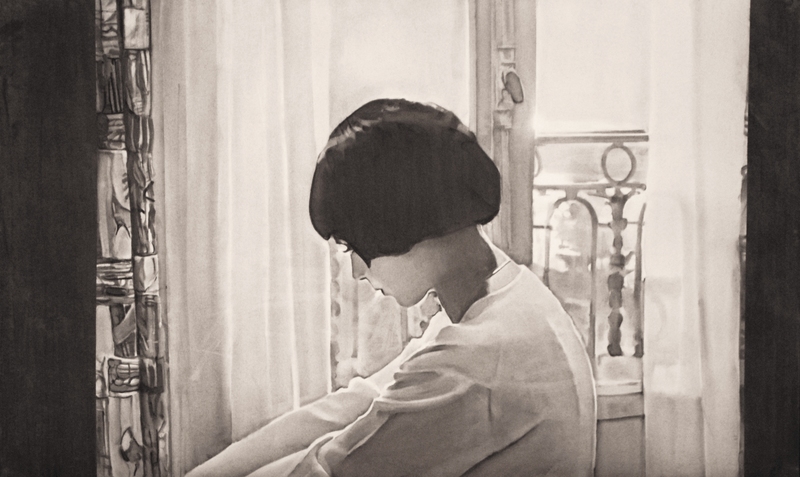 These charcoal drawings capture slices of time—moments half a century away haunt this exhibition. The show continues until September 22nd. Click here to find out more about the “Cinemarks” at the Abbozzo Gallery. Have you ever looked back at your life and found the roots of a passion that developed later in life? I’ve recently contemplated my love of visual art and where it all began. Although I can’t remember the outing, my parents took me to a show at The Robert McLaughlin Gallery (RMG) in the Fall of 1976 called Ontario Collects. 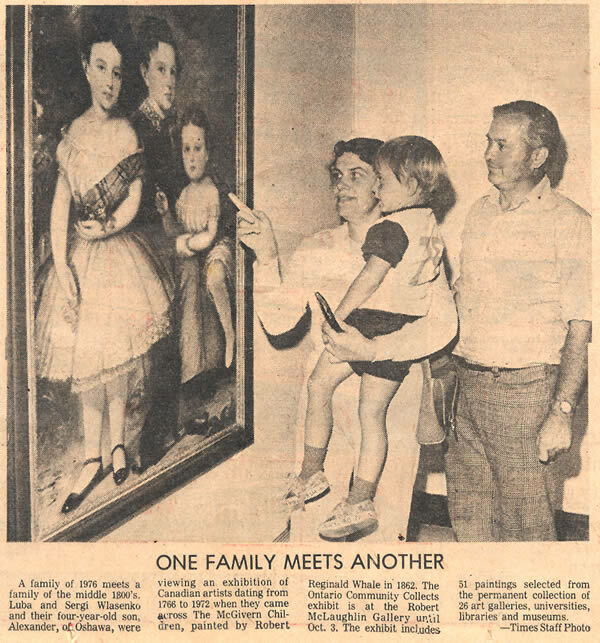 We were photographed looking at a painting by Robert Reginald Whale–a triple portrait of children. This picture appeared in the Oshawa Times. For me this clipping remains dear to my heart in many ways. It’s a document that shows an early connection with my hometown gallery. Fast-forward thirty-five years. The RMG recently unveiled their reconditioned permanent collection space with old favorites and some new acquisitions. I was very moved and honored to have a couple of my drawings included in this re-hanging. Roman Street and Record Player are two works from 2009. Seeing these film-inspired works flanked by a Barbara Astman photo and a Norval Morrisseau painting was an eclectic and inspiring curatorial decision, offering multiple interpretive routes (thanks Linda). Over the years, I was involved with the RMG in many ways: as a visitor, a summer student, an employee, an art instructor, and now an artist in the permanent collection. Reflecting back on this continuum, it’s important to acknowledge the importance of local galleries and the many ways they shape our cultural world view. In these days of hyper-active paradigm shifts and quantum-paced changes, it’s refreshing to press pause. This type of reflection is happening at the Gallery these days. A trio of complimentary exhibitions ponder the stages of personal development in the life of an artist. Then & Now is inspired by key works from the permanent collection. In many cases the works are from the late seventies and early eighties. These works are paired with recent studio production from those same artists. I really enjoyed working on this show, since it familiarizes me with the practice of established artists. All six artists are paragons in their field. For those of us working as visual artists, they show something to aspire to: a tenacious devotion to visual production over the decades and a restless curiosity in keeping with contemporary practice. Then & Now tests the boundaries of studio production and how it folds together and/or evolves over the years. The seductive photographs of Holly McClellan line the walls of the Yourspace Community Gallery. Her images synthesize the investigative impulse of photojournalism combining this with the aesthetics of art photography. McClellan’s lens has consistently focused on ecological concerns. Her current series explores how municipalities process one of our most precious natural resources, water. A perennial favorite is the year-end DurhamCollege show. Now in its fourth year at Station Gallery, the College’s foundation programme is a one-year “crash course” in the full range of disciplines including drawing, painting, print-based, sculpture, digital and performance. What’s more, this year’s offerings are much more than manual and retinal exercises; they demonstrate a conceptual engagement for both the maker and the viewer. 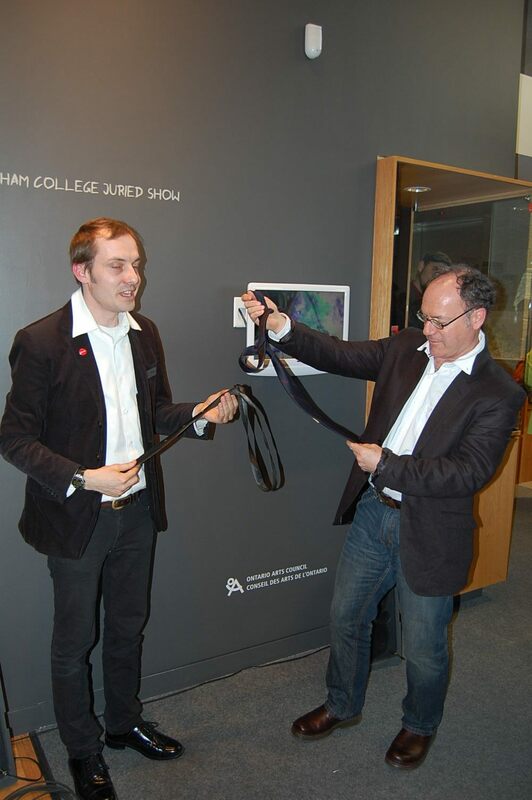 The highlight for me is what has come to be called “The Traditional Exchanging of the Ties,” a ritual that Professor Sean McQuay and I partake in every year. It’s a symbol of how our two institutions are tied together (sometimes with a triple-Windsor knot). I can't believe my eyes, it's the "Traditional Exchanging of the Ties!" A few weeks ago, I was uncertain about which drawing I would part with for the Gallery’s upcoming fundraiser called Drawing for Art (DFA). I posted four works and asked you to vote and comment on your favorite Olex drawing. If last year’s vote was more of a nail-biter with all four works jockeying for first position, this year’s vote had a clear leader. Station was the favorite from the start and ended with just over half of the votes going to the street scene. The next step is to get it framed, matted and ready for hanging for the in-gallery preview that will run from April 14 until the big night on Thursday, April 28. Starting April 1st, you can check-out the high calibre of artists’ submissions for this year’s DFA on the gallery website for the month of April. It’s most interesting to see the ebb and flow of popular taste. Station is an older work that I’ve shown on several occasions. Many years ago, I displayed it at the Toronto Outdoor Art Exhibition on Nathan Phillips Square. It seemed to go unnoticed. 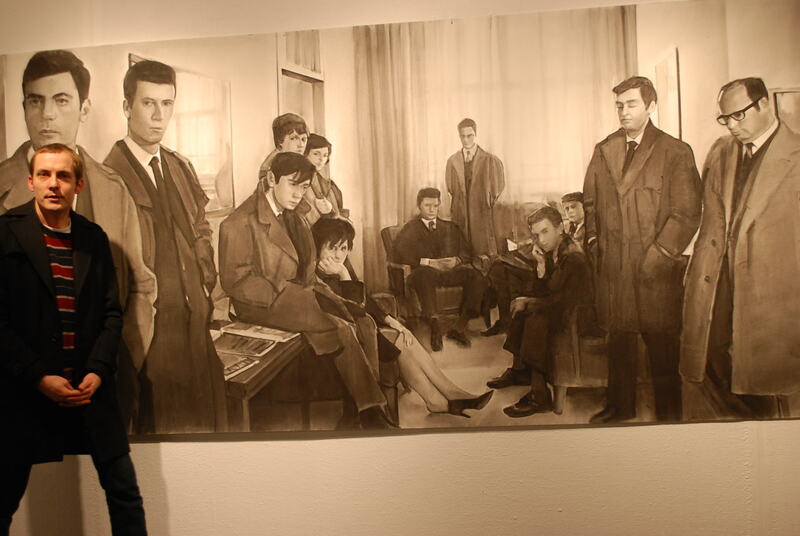 The majority gravitated to the figurative works and pictures with people. The opposite was the case with this on-line vote. How could this be explained? Could it be that people are tired of being indoors all winter and are more interested in outdoor scenes like Station? I’d be interested to hear your thoughts…. Last night Drawing 2011 opened at the John B. Aird Gallery in Toronto. This is the twelfth year the event is held at the downtown venue. I had the good fortune of participating in this annual showcase of Canadian drawing. I’m honoured to be in a show alongside some of my favorite drawers like Amanda Burk of North Bay, Amanda Schoppel and Tom Hendry both based in Toronto. The show acquainted me with the many approaches to the drawn medium. a more economical and stream-lined use of resources, gallery staffing, etc. It’s a dilemma. So I put it to you, the blogosphere; what are your thoughts on submitting to juried shows? Digital or Tangible; what works best?